Posted on November 22, 2013	by Denise Banks-Grasedyck, Coach. Consultant. Speaker. I recently conducted a two-question survey to find out what my readers would like for me to write about in my “Fantastic Friday” posts on my Facebook page. This was great because the purpose behind my Facebook page, as well as this blog, is to connect and serve you. If you participated in that poll, thank you! In response to my survey, one of my readers, a busy, successful entrepreneur, married to another busy, successful business man, asked, “How does a couple reconnect when they both come home on a Friday night with their heads stuck in their individual business worlds?” She made a specific request for tips on speeding up that sometimes awkward transition process from being in work-mode to unwinding back into a couple and family. This is a great question and a topic I am happy to address. Successful people know how important it is to make time and space to tend and nurture good business relationships, so they make it a priority and do it on a regular basis. This is the same principle that helps every relationship to grow and thrive, so apply it at home as well! It is unlikely that you would burst into your work office and immediately spend the next 45 minutes raving or ranting non-stop about all that went on with your spouse, your children and your family pets. And yet, how often have you come home from work or out of your home-office only to greet your partner (or be greeted) with a recount of your business day or perhaps the whole week, in what feels like real-time? No matter how awesome or how awful your work week was, trust that your significant other, not to mention your children, your cat or your dog, are not really up for reliving it all again. They want to have you, your focused attention, your complete presence in the moment with them. You know, just the way that you ask them to understand that when you zone-in and focus on important work, you need time for just that. Of course, it is important to share about your work so that your family knows that by supporting you, they have a role in your success and in your life’s journey. After all, can a truly successful life be built on one-sided business success? Ok, so let’s cut to the chase and to the tips for making the weekend transition from work-mode to engaged partner, parent and/or family member. 1) COMMUNICATE: Communicate your desire for full presentce and engagement with your family. Letting them know that this is important to you, strengthens your commitment to make it happen and encourages their support and participation. 3)PLAN: Yes, really, have a plan! For some reason, I have seen it happen time and again, that some of the most plan-oriented, project-minded, strategically prepared business people, somehow forget that these same wonderful skills can also serve you wonderfully outside of work. For most people, Friday and weekends follow and incredibly predictable pattern, so use that knowledge and plan ahead. The next Friday, is almost certain to follow. Get everyone involved. 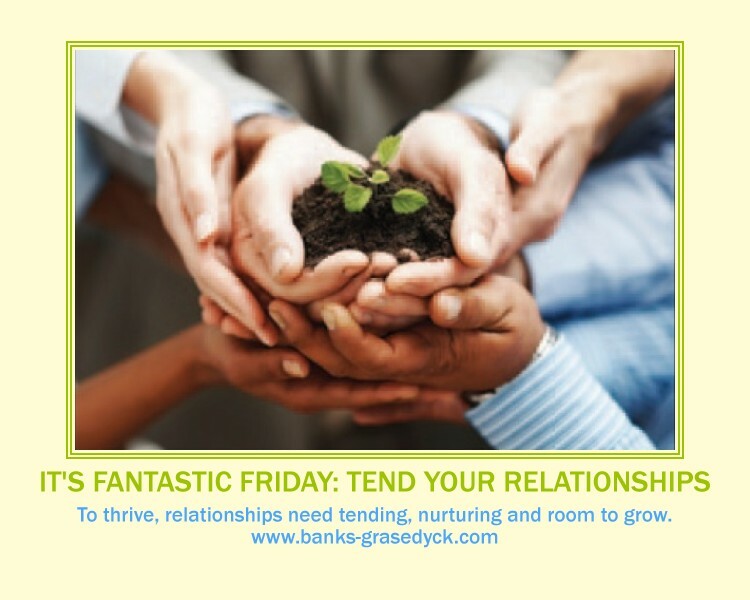 Ask your partner and other family members, what they would specifically like to do on Fridays. Be creative in the decision making process: draw ideas from a bowl, roll dice to determine who gets to decide this Friday, play Tic Tac Toe or simply go in roll call order. 5) PRACTICE: Keep at it! Now that you have committed yourself to really being present and engaged so that you can tend and nurture your personal relationships, really allow yourself to enjoy these precious hours. After a few Fridays, the transition will be so fluid and effortless, you are likely to exit work mode, before you even close your office door. So these are my tips for getting out of the work-week mindset quickly while simultaneously tending and nurturing your relationships. How did I do on my first 100% reader-requested post? Or you may leave a comment here on this page or if you like, visit me on Facebook: https://www.facebook.com/denise.banksgrasedyck Either way, ask for what you need and you will probably get it! This entry was posted in Better Relationships, Communication, Work, Life and Balance. Bookmark the permalink. I agree it’s really important to carve out time to be together. It’s so easy to stay busy with work and household chores that we don’t make time for each other. I LOVE the Friday Ritual Idea! What a great way to kick off the weekend and create the transition I was looking for. Brilliant. I also think your reminder to communicate and plan for this, as a goal, is important, I think about this all the time, but haven’t shared the thought with my husband. Bingo. Brilliance again. Thanks for taking the time to answer my question! Wendi, thank you for asking your question and for taking the time to give me some feedback. I am happy to answer questions anytime and I am grateful for the opportunity to do so via this forum. Have a great weekend! Great ideas Denise and so true that we all focus and plan for work and business yet not on the home front. Rituals are such a powerful tool, to start our day or close out our work week. Thanks for offering these tips. Elaine, thank you for stopping by and for taking the time to comment. Reading that this resonates with you is more motivation to share simple tips for immediately implementing what you smart people already know! Great blog post Denise. I think you did an awesome job on your reader’s request for solutions to re-connect with their spouse|family after a long week of work. Totally true that we entrepreneurs can get so caught up with our work that we can easily neglect or forget to nurture our personal relationships. Smart planning can work for family or relationship time just as it does for a business! Life is too short to miss out connecting with the ones we love! Thank you for this great blog-post Denise! Thank you, Gabrielle! I appreciate you taking the tine to read and to comment. Love the idea of a Friday night Weekend Kick Off Meeting! That sounds like a lot of fun and a great way for everyone to connect! Thank you, Pam. Never underestimate the power of a good milkshake! The Friday ritual is a wonderful way to connect. Brava!